Just 34000 miles on this well cared for Jeep Compass 2.1d LIMITED 5dr in black with a black full leather interior. Superb condition both inside and out. A compact SUV that isn't afraid to get its wheels dirty. The Jeep Compass features a rugged appearance and a confident stance that's backed up by real off-road performance. Highly capable when the going gets tough, it's a car that's built for adventure. The interior is well thought out and there's plenty of space available for passengers and luggage. Discover more by contacting a member of the showroom team at Wright Vehicle Solutions today. 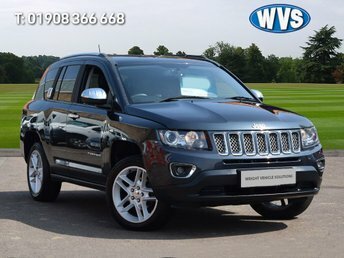 You can also view the complete range of used Jeep Compass models for sale in Bletchley, Milton Keynes here on the website. Contact us now for more information and to arrange a test drive in the vehicle of your choice.